"Come away and rest awhile." These words of Jesus in the Gospel of Mark have often served as the motto of the retreat ministry initiated over sixty years ago by the friars of the Province of St. Barbara. In this ministry, rest, prayer and reflection in peaceful and beautiful surroundings are far different from what they might at first seem to be: namely, a passive escape from the activity of the world. On the contrary, retreats are often the seedbed of enlivened, renewed, and reinvigorated service that can lead to a radical challenge and deeper personal commitment to the guidance of the Holy Spirit. 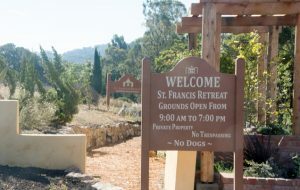 Under the guidance of the Franciscan friars, retreats address a spiritual hunger in people of every faith tradition. Visit our centers’ websites for more information on our upcoming retreats, workshops, classes, liturgies, and events.